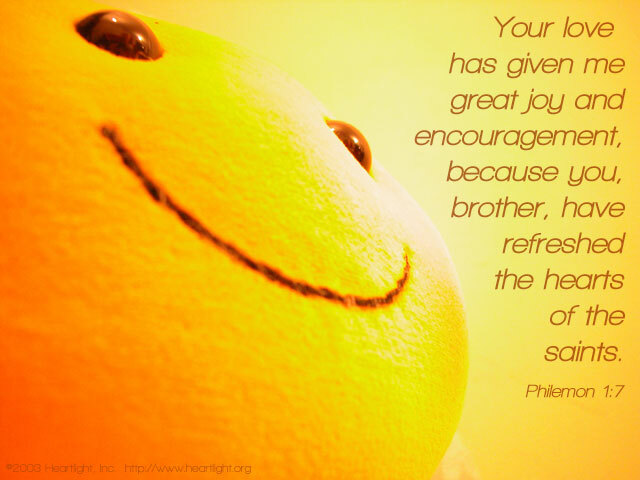 Wouldn't this description of Philemon be a great one to have said about you! To be loved, supported, and encouraged by an encourager is to have your heart refreshed and your attitude lifted. Let's make a commitment to be an "encourager" who refreshes the hearts of those around us this week. Tender and loving God, thank you for leading the people into my life who have encouraged me when I most needed it. Please give me the eyes to see and the heart to serve those around me who desperately need my encouragement. In Jesus' name I pray. Amen.